Acrovyn® Door Cladding provides a durable, protective skin for any door, ensuring extended lifecycle and reduced maintenance costs. Full or partial door cladding is supplied in thermoformed angles and channels to suit your door. Available in more than 30 colours and in any shape, Acrovyn door cladding is a flexible, cost effective solution to door protection. It is recommended that plates are fitted between the door stops on the push side of the door. 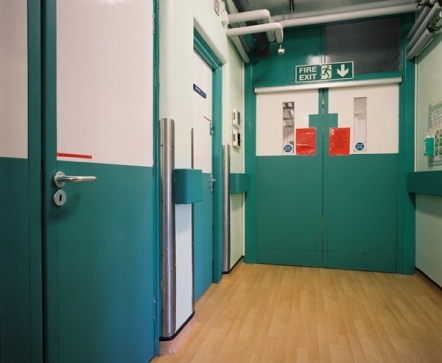 CS Acrovyn Full cladding protects the entire door surface, including door edges. Designed for existing doors, two 90° profiles are supplied to the required specification in 2mm thick Acrovyn Sheet. CS Acrovyn Partial height cladding. Uses 2mm thick Acrovyn channels for recess mounting into door edges. Complete with 2mm bevelled edge Acrovyn facings. 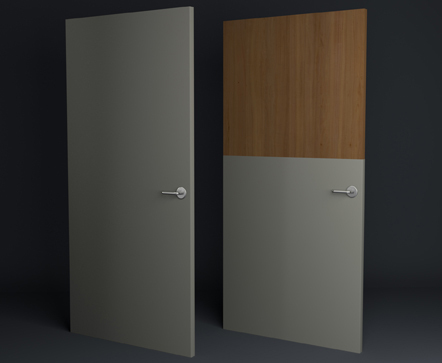 Different door configurations are built up from from systems of Channels, Angles and Plates. Basic channels and angles are made to specific sizes using line bending. Finished bend achieved is pencil round on outside bends. Note: The thickness of Acrovyn Sheet should be taken into account in calculation of channel and angle sizes. Please provide internal dimensions required, as show on the drawing.